danger garden: Brown Building Materials, a rusty paradise. During our recent visit to Spokane we stopped by another favorite old haunt, Brown Building Materials. As with everything, it’s changed over the years. This used to be essentially a big junkyard; you could spend hours walking around looking at scrap and discovering treasures. Then there was a big fire, and they cleaned up their act. Moved and consolidated, organized. In fact I’ve never seen it so organized. There was still plenty of inspiring rust though. Things that had me thinking of Reuben at Rancho Reubidoux, oh what he could do with these amazing finds! Garden structure, trellis material, planters…it’s all here…if you have a little imagination. Of course not much is priced, you risk falling in love with expensive junk. In my case all I left with was pictures (remember I had already filled the car with plants bought earlier in the day), but I was very inspired by these… You’ve got to love plants (some would say weeds) that are happily growing regardless of their location. And it’s not all rust at Brown Building, they’ve got some fabulous concrete and clay relics as well. In the end this visit had me thinking about the book The Revolutionary Yardscape, by Matthew Levesque, a book that I read and just didn’t click with. I also read a review of the book on Reuben’s blog and commented saying as much. But walking through and looking at all of this great stuff just dying for a new life I think I finally got why Mr. Levesque’s book has been such a hit. Not everyone has the ability (or time) to see the possibilities in the junk that surrounds us. Someone who can get others excited about reusing things that have already been useful once, and then cast off, rather than going out and buying new things, is doing a very good service to the planet. I think I’m going to email Brown Building Supply and suggest they get a store copy of the book! Oh my gosh, I'm planning a trip to Spokane RIGHT NOW. That place looks amazing. I hope you said something to them about some of their building materials being gray. False advertising, and all that. Yes, I read the book and felt the same way. I love old rusty things but this author was more into the modern-esque style of repurposing. I just like the stuff, not necessarily making it into something else. I would have loved visiting this place but would have been frustrated that things weren't priced. Great photos! What a wonderful resource. My boyfriend and I are trying to figure out how to get some old manhole covers out of a creek where we wade. Someone just dumped them there so they're free for the taking. Unfortunately they weigh about 80-100 lbs each. Heather, have you ever been? It's worth a road trip...a nice long weekend getaway! Darla, I'd be interested to hear what you think of it. Grace, I see what you mean about the "modern-esque style of re-purposing" well put. BlackCatBone, sounds like an intriguing problem with the potential for success, or injury! rancho, oh heck I'll rent a truck and drive them down, that way I can see your garden in person! So many materials to play with! Wow! In Tacoma we have Jones Glass and Used Materials which is much like a pre-fire Brown. What great stuff. If you ever get to Vashon Island, make a point of visiting "Dig" (a nursery.) The owners, Ross and Syliva, are masters of re-use. They also sometimes allow folks to tour their home garden (up the road a piece) to raise funds for charities; It's a fabulous example of reusing huge industrial "junk" in a pleasing, almost organic way. Very cool! I could nose around a place like that for hours and hours. I wish I had the repurpose gene--I don't! Those terra cotta tubes would make interesting planters, maybe? I think I'd get lost there for a few hours. 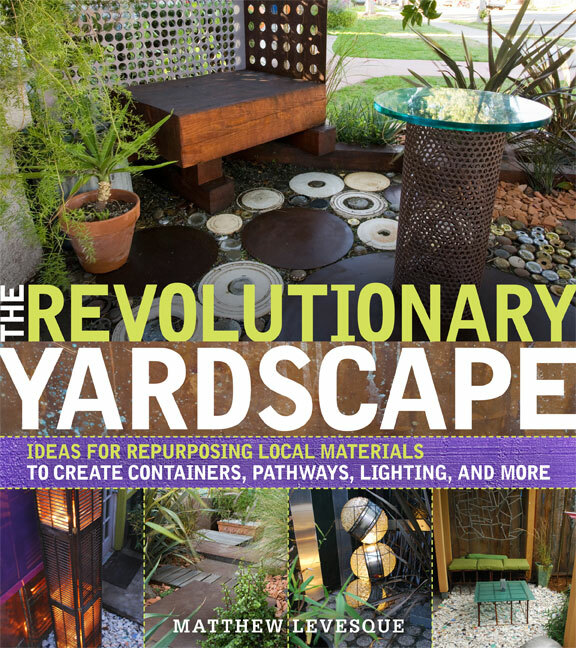 The book looks interesting in that it appears to show ways you can repurpose scrap without dedicating your garden to cute welded figures made out of rusted shovels and rakes. I'll have to take a closer look at it. great stuff Loree. We must have someplace like this in the PDX area though. Oh, wow!! ...do we have such a place here in Portland??? yeah, Rejuvenation used to have more metal but scrappers have been skimming up more metal these days (since the prices went up) and when you find it there, it's often expensive. It can of course be found at the ReStore, Rebuilding Center and even Hippo, too. I believe there's also a place in Northwest that could be googled... will ask around! ricki, close...but only with a lower case "c"
Mark and Gaz, so true. And personally I feel there is a fine line between up-scaling things like this well, and having them end up looking like tire planters. Peter, that place (Dig) has been on my list to visit!!!! James, a yes...or perhaps a toilet re-purposed as a planter? Ryan, the thing about Spokane is that things like this are overlooked because the culture is very different. Portland is very DIY and into recycling. Spokane, not so much. For the same reason the thrift shopping there is amazing...here, not so much. Lauren, see my comment to Ryan and also Kate's comment below! Kate, I'd love to see what you come up with and yes I agree that all the places you listed are resources but none seem to have the depth that Browns does, mainly for the reasons I mentioned to Ryan.